Chabad of Auraria Campus, while providing for the needs of Jews in Denver and beyond, focuses on providing for the needs of Jewish students and faculty at the 3 colleges of Auraria Campus: Metro State University of Denver (MSUD), University of Colorado at Denver (UCD), and the Community College of Denver (CCD). 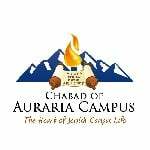 Chabad of Auraria Campus is founded on the principle that, while Jews embrace many levels of observance in their personal lives, there should be a place for all Jews – no labels, no affiliations – to enhance the experience of being Jewish, to learn, to grow and feel at home. Chabad of Auraria Campus is that place. By focusing on the individual’s relationship to Judaism, the center appeals to all and follows many paths to enriching Jewish life at the 3 colleges of Auraria Campus. Not only do we offer our time and resources to help students and young professionals, but we also open our home to host traditional Jewish services and meals as well as inspiring classes. Chabad is also dedicated to dispelling myths and misinformation about Judaism as well as promoting acts of goodness and kindness for all students on campus regardless of their background or affiliation. To that end, we give lectures about Judaism as part of MSCD’s Multi-Cultural program to students from many different backgrounds and beliefs. Rabbi Yisrael Moshe and Aura Ort have lived in Denver since 2003 and started to establish Chabad of Auraria Campus in the beginning of 2005. Chabad of Auraria Campus became the first Jewish organization on campus at the beginning of the fall semester of 2005.